The interannual variability of the Atlantic cold tongue (ACT) is studied by means of a mixed-layer heat budget analysis. 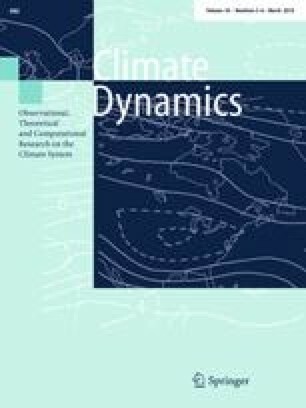 A method to classify extreme cold and warm ACT events is proposed and applied to ten various analysis and reanalysis products. This classification allows 5 cold and 5 warm ACT events to be selected over the period 1982–2007. Cold (warm) ACT events are defined by the presence of negative (positive) sea surface temperature (SST) anomalies at the center of the equatorial Atlantic in late boreal spring, preceded by negative (positive) zonal wind stress anomalies in the western equatorial Atlantic. An ocean general circulation model capable of reconstructing the interannual variability of the ACT correctly is used to demonstrate that cold ACT events develop rapidly from May to June mainly due to intense cooling by vertical mixing and horizontal advection. The simulated cooling at the center of the basin is the result of the combined effects of non-local and local processes. The non-local process is an upwelling associated with an eastward-propagating Kelvin wave, which makes the mixed-layer more shallow and preconditions the upper layers to be cooled by an intense heat loss at the base of the mixed-layer, which is amplified by a stronger local injection of energy from the atmosphere. The early cooling by vertical mixing in March is also shown to be a good predictor of June cooling. In July, horizontal advection starts to warm the mixed-layer abnormally and damps SST anomalies. The advection anomalies, which result from changes in the horizontal temperature gradient, are associated in some cases with the propagation of Rossby waves along the equator. During warm ACT events, processes are reversed, generating positive SST anomalies: a downwelling Kelvin wave triggers stratification anomalies and mixed-layer depth anomalies, amplified by a weaker injection of energy from the atmosphere in May–June. In July, warm ACT events are abnormally cooled due to negative horizontal advection anomalies resulting from processes similar to those that occur during cold ACT events. This additional cooling process extends the period of cooling of the ACT, reducing SST anomalies. The authors gratefully acknowledge comments of the anonymous reviewers that led to significant improvements. The research leading to these results has received funding by the European Union’s Seventh Framework Programme FP7 PREFACE under grant agreement 603521.